A busy and interesting week hosting an international delegation and presenting an alternative water plan. Some common themes for sustainability, urban water resources and agriculture. Previous analysis of water resources and agriculture in the Middle East resulted in an invitation to lead a delegation of leaders from Saudi Arabia to Australia. The delegation water interested in sustainable water resources, recycling and tertiary agriculture. Our first two days were spent in South Australia and we were assisted by SA Water (Thanks to Greg Ingleton). These projects also use renewable energy from solar and organic waste sources, and generate carbon dioxide from waste to stimulate rapid growth. Natural pesticides are also utilized. The vegetable production from these projects ranges from 20 kg to 70 kg per square metre per year. 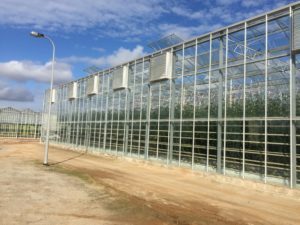 One project uses 35 ha of greenhouses to supply 60% of Australia’s demand for tomatoes. 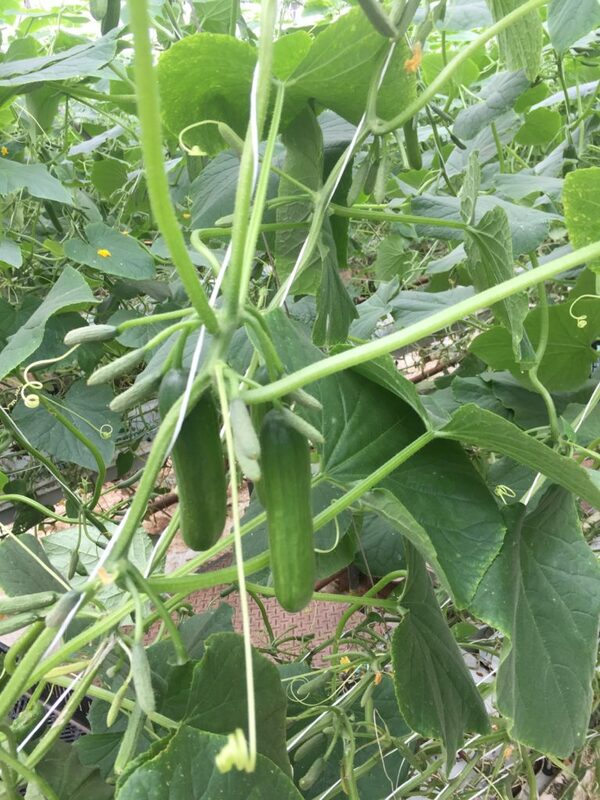 An example of mass production of mini cucumbers is shown below. 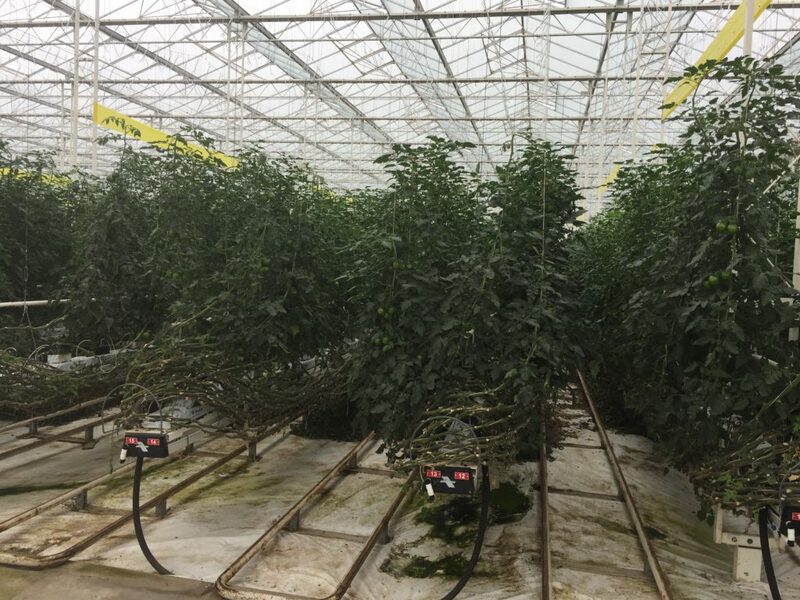 These projects demonstrate that high yield vegetable crops can be growth on the fringe or within urban areas using local resources, rainwater and urban wastewater. Rather than transporting wastewater, and excess rainwater and stormwater across long distances for discharge into waterways and oceans, these resources can be used locally to feed our cities. Production of food using local resources improves the resilience of urban areas – even in arid regions – with substantial efficiency in use of water (70% reduction) and energy. The collection and treatment of wastewater from Adelaide at Bolivar is shown below. On the second day, the delegation also visited examples of aquifer storage and recharge, stormwater and rainwater harvesting, and water sensitive urban design projects. In particular, the use of local water resources to provide greener urban areas to reduce heat island effect and produce food was of particular interest. South Australia provided many outstanding examples of sustainable water resources and urban agriculture. 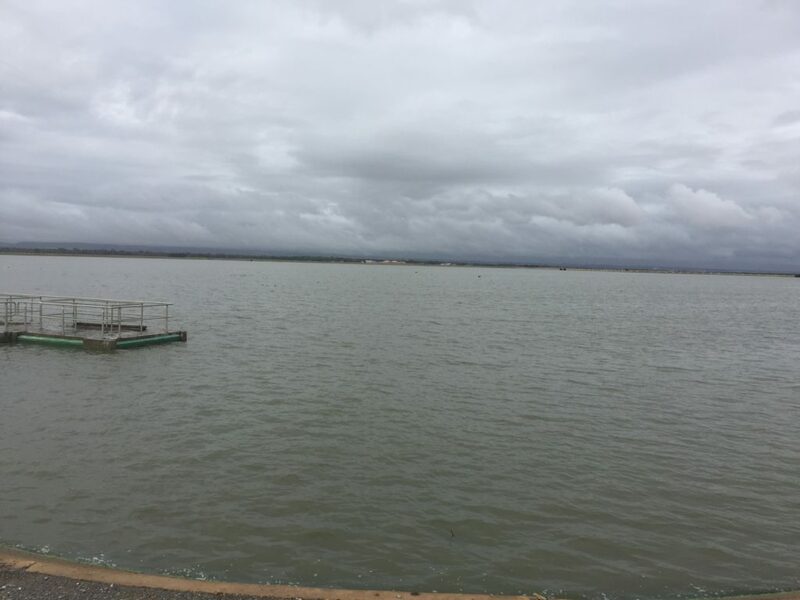 A workshop on strategy, policy and legislation to implement sustainable water resources and agriculture was held on the final day in Sydney. Our visitors were engaged by discussions about modernization of irrigation districts (such as the Murray Darling Basin), urban water reform to include local solutions, urban agriculture and water sensitive urban design, Australian Rainfall and Runoff, Australian Runoff Quality and a range of significant policies. There were fascinating contributions to the workshop from Dr Paul Grimes (former secretary of agriculture), the Commonwealth Department of Agriculture, Mark Babister, Tony McAlister and Dr Michael Barry. The plan recognizes that household welfare is a key economic driver. Total household expenditure on water utility services has increased by 143% during the last 15 years for only 2% increase in water demand. In contrast, the increases in costs due to inflation was only 38% during the same period. These rapid increases in utility bills impacts on disposable income and household consumption which decreases the viability of the economy. At a time of diminishing household welfare due to increased debt and low growth in wages, utility bills are growing rapidly. Operating costs of water utilities are driven by expansion of cities, desalination and water grids. These costs have increased by 111% to 199% for utilities in Greater Melbourne over the last 15 years. The historical data shows declining economic efficiency of current sole reliance on centralized provision of water and sewerage services. Melbourne households and the local economy is bearing the costs. However, there is some good news with the discovery of local actions at households within Greater Melbourne currently provide over 130 GL of water supply as shown below in the water balance of household water uses. 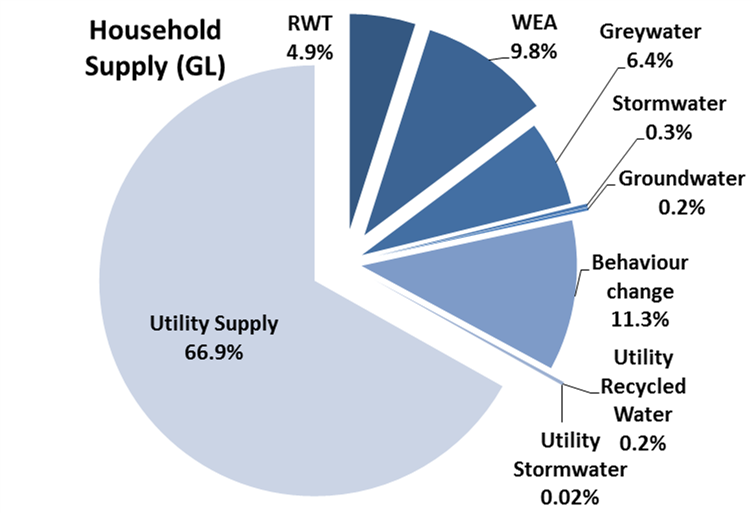 These local household contributions avoid the need for the second desalination plant and even greater increases in household expenses for utility water and sewerage services. Importantly, these existing local contributions are also providing significant “hidden” reductions in stormwater runoff and associated impacts on waterways. We cannot afford to loose these contributions due to a perception that nothing else is viable. It is proposed that government planning policy that sets targets for reduced water and energy demands and stormwater runoff from buildings will improve the economic efficiency of utility water services. 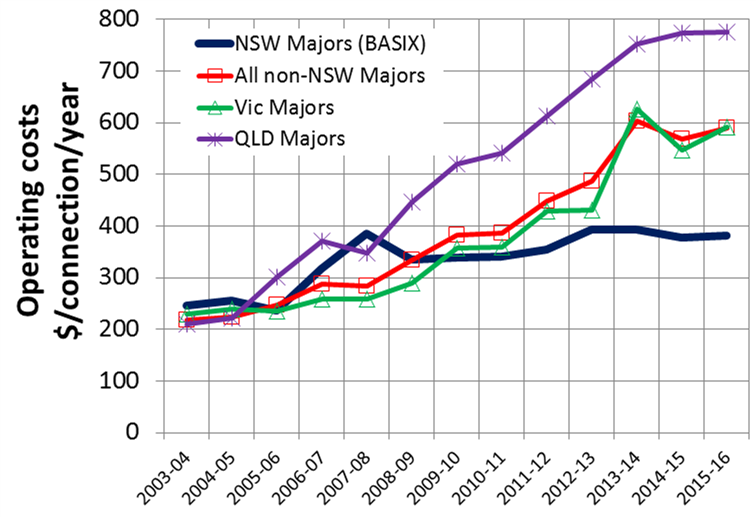 This outcome is demonstrated by the NSW BASIX policy in the following graph of national water operating costs. The growth water operating costs is significant for South East Queensland (267%), Victoria (157%) and for the average of all major utilities outside of the NSW (171%). Major utilities in Adelaide (140%) and Perth (77%) have also experienced significant growth in water operating costs. In contrast, the growth in water operating costs of NSW major utilities (55%) is substantially less than the other areas. The significant impact of dependence on water grid infrastructure (long pipe transfers between regions) in South East Queensland seems to be driving the highest growth in costs whilst the BASIX policy for sustainable buildings is driving the smaller increases in utility operating costs. These results demonstrate the challenges and opportunities for Greater Melbourne. We are mindful that a water grid is currently preferred for the region but sustainable buildings and urban agriculture provides an opportunity to improve the economic efficiency and sustainability of Greater Melbourne. The Alternative Water Plan for Melbourne evaluated the performance of policy for sustainable buildings that required reductions in water demands (40%), energy use (40%) and stormwater runoff volumes (30%). This option was evaluated as water efficient appliances, rainwater harvesting and edible rain gardens (urban agriculture). It reduces net present costs to 2050 for water cycle management by more than $5.75 billion. This equates to a total cumulative saving to households, water utilities, Councils and State government of more than $16 billion to 2050. The Sustainable Buildings option reduces the costs of providing water cycle services which diminishes the need for increases in water and sewerage tariffs. This option also contributes to stormwater management, protection of urban waterways and amenity with urban catchments by reducing stormwater runoff volumes, nutrient loads discharging to waterways, and risk of flood damage. 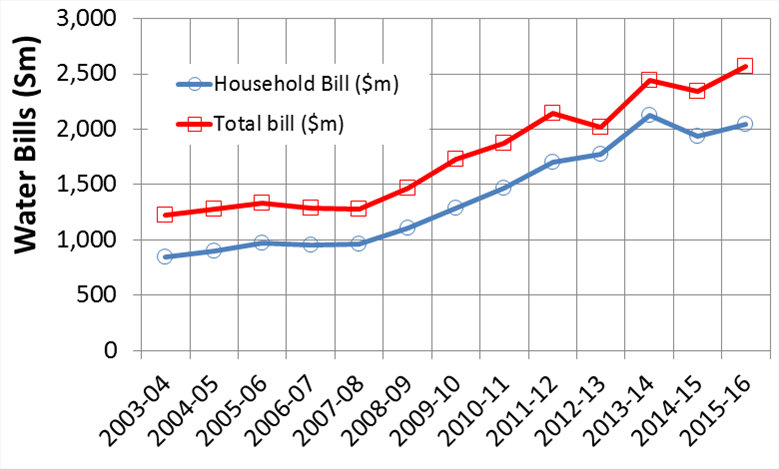 The total household expenses for utility bills in Business as Usual is expected to increase, in real terms (using 2016 values), by 62% by 2050 for the Greater Melbourne region. In contrast, the utility bills only increase by 16% in the Sustainable Buildings option. This equates to a saving of $912 m which can be used elsewhere in the economy. Note that this analysis has included all of the costs of water efficient appliances, rain gardens and rainwater harvesting. This analysis is conservative because it has not counted the household scale benefits – downwards pressure on utility water and sewerage bills, and reduced stormwater management costs provide the benefits presented here. However, the additional household scale benefits are substantial and will be included in the final plan. There were clear synergies between the insights from the international water resources and agriculture mission, and the development of an alternative water plan for Greater Melbourne. The new economic opportunities for water resources and agriculture are within cities. The Alternative Water Plan for Greater Melbourne will be released soon. Thanks Peter – it was fantastic to meet and chat with your delegation from KSA.